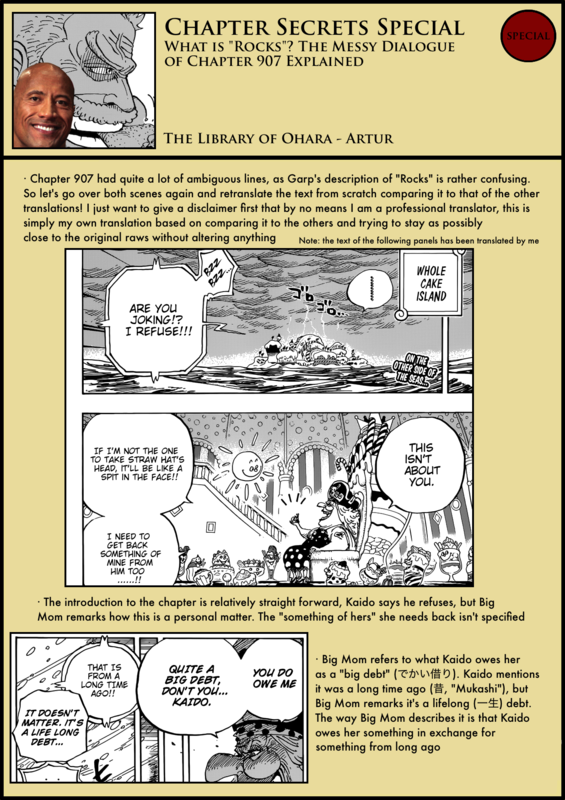 The whole situation around “Rocks” in Chapter 907 was rather confusing, so let’s shine some light around it and re-translate the text! Also, there’s a certain subject I haven’t talked about yet that regards the relationship of Kaido and Big Mom, so I made it into a video, consider checking it out! about that…the first thing that came to my mind when i read the chapter was not that “Rocks” would be a guy or a group. my thought went straight to PONEGLYPHS! could it be that Garp was being vague, using a code for it, as people are not supposed to know about it? he is a Hero but yet noone seens to know why, he even make it more clear implying that despite she has an officer rank inside the marines she wouldnt know about it. Could it be that Garp stopped “the truth” from coming out 40 years ago, making him a Hero in the eyes of the world government? 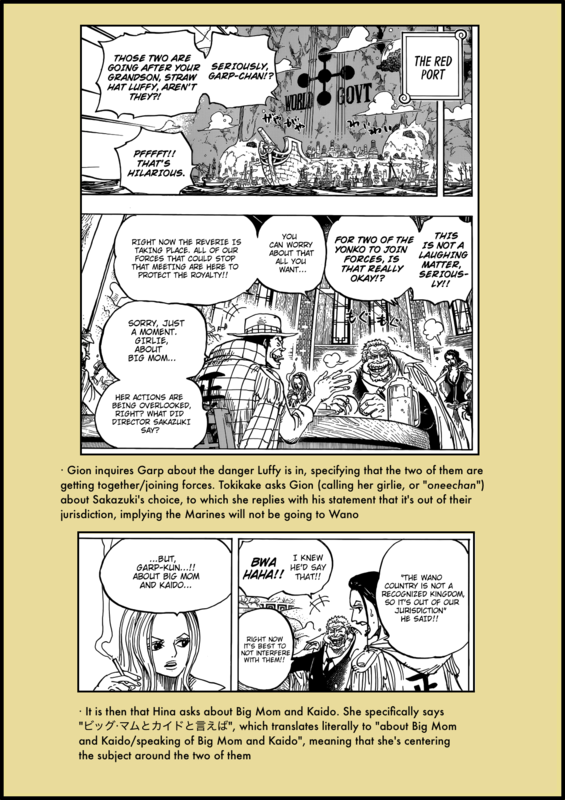 How about the legend that Oda has mentioned it before about the legend in One Piece World where the legend related with Whitebeard? Before Gol D. Rogers, there was Gol D. Rocks. Hehe. 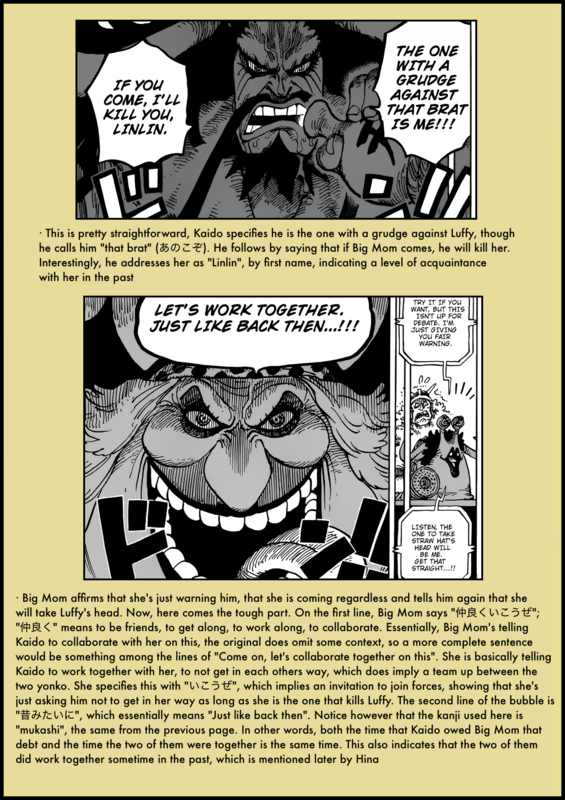 I basically agree with everything that you wrote, but it really doesn’t seem Oda’s style to make a reference to something twice in the same chapter, Big mom telling Kaisou to team up (again) and then Garp kinda talking about it, something just feels off. 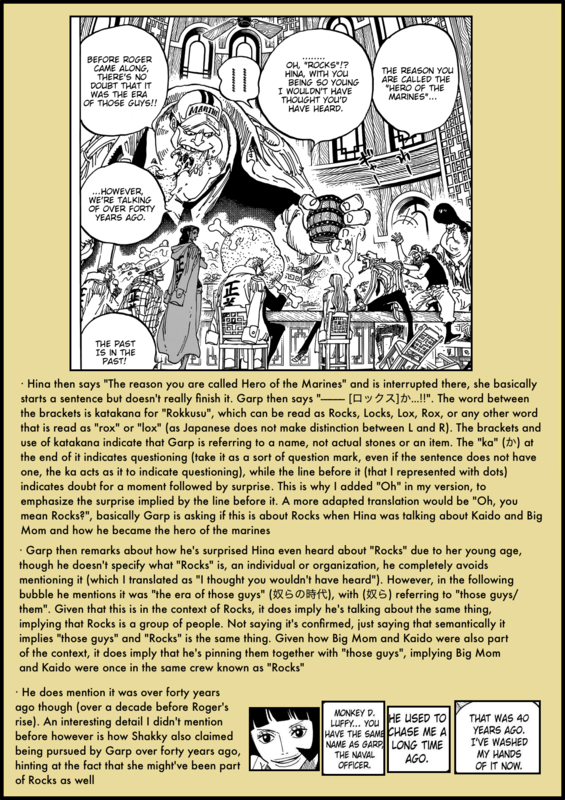 This may make no sense whatsoever, but when translating Hina and Garp conversation, is there any chance that “Rocks” is just Garp calling Hina “Locks” as a nickname? due to her Devil fruit? Actually, I’d say the complete opposite. It’s totally Oda’s style to tie in things within the same chapter. The reason he likely even showed the scene with Big Mom and Kaido is because he wanted people to know about their involvement in Rocks later and to know that there was some relationship between the two of them. As for the nickname, it’s stated in the post, Garp inquires about Rocks as a question (as in, “are you talking about Rocks?”), it wouldn’t make much sense referring to Hina herself. I have some doubts (sorry if I’m late, but I’d really aprociate your answers). Is Ace Novel cannon material? If i’m not mistaken, in the latest volume, it is said that Big Mom and White Beard are considered Old School, while Shanks and Kaidou are from a new generation. 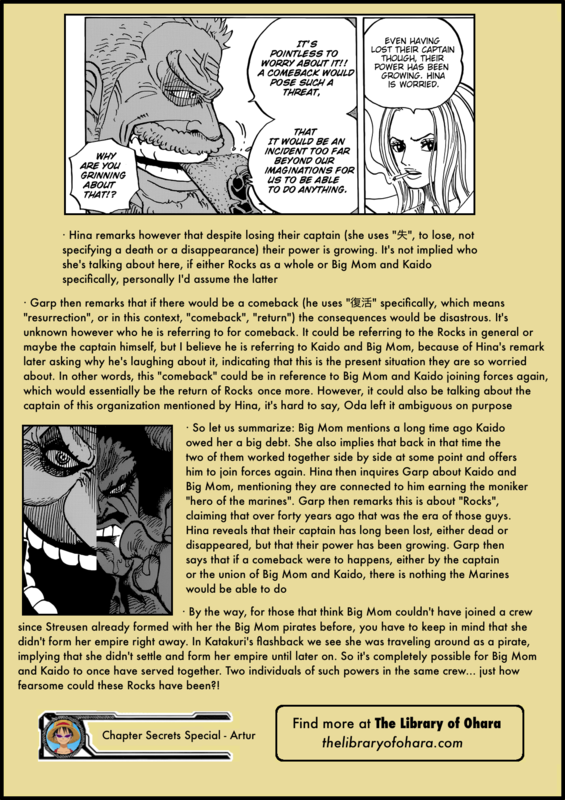 Also, it is said that Kaidou was some sort of Big Mom’s subordinate. Did I get that right? I think it would fit very well on this Rocks’ story. Ace novel was stated to be canon by Oda, yes. However, it only says that Kaido’s rise as a yonko was recent (same with Shanks), it never said that Kaido became a pirate recently. In other words, Kaido has been active for quite some time, but like Shanks, he only started forming a crew and becoming a yonko after Roger’s death.